Spot silver ended the trading session on Friday with a wide spread down candle, which reversed almost all the gains of Thursday, and suggested once again that we are in a bearish phase at present for spot silver prices. However, as I have outlined in several recent market commentaries for the industrial metal, for those of you that follow my spot gold daily analysis will see that I am bullish on gold, despite the recent mix of conflicting signals that we currently have on the daily gold chart. 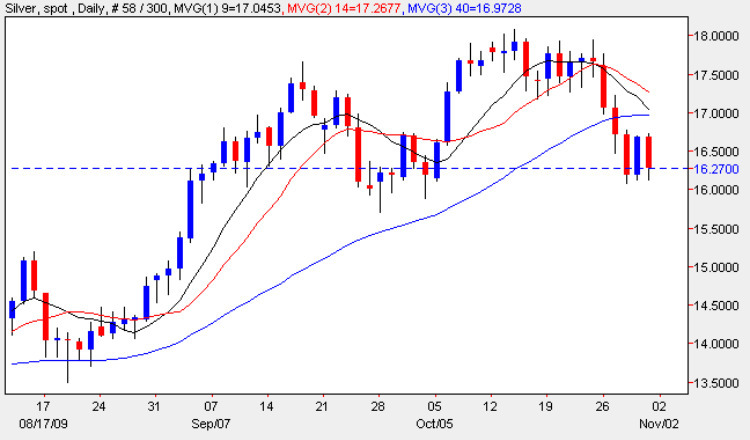 Silver on the other hand has a more bearish flavour altogether, with all three moving averages weighing heavily, and with the deep resistance now overlying the current price level, it will, take a move of some momentum to break and hold above the recent top just below the $18 per ounce price point. The bearish sentiment is further confirmed by the 9 and 14 day moving averages which are about to cross the 40 day average – not an encouraging signal. However on the plus side, the $16 per ounce price handle does seem to be providing a degree of support, with Wednesday, Thursday and Friday’s candles all finding a platform at this level, but whether this will be sufficient to build a bullish rally, only time will tell. In the short term, whilst the technical picture for silver is certainly bearish, we may see the opposite effect, as spot gold pulls the industrial commodity higher in due course – an odd conclusion perhaps based on the above chart, but sometimes one just has to go with instinct, and my feeling is that gold is likely to push higher in the short term, pulling silver along in it’s wake!